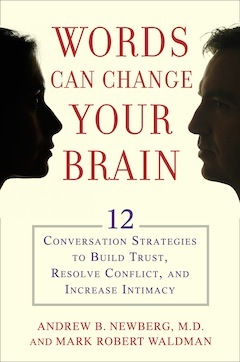 Waldman and Newberg have been collaborating for almost two decades, and have written 14 books about relationships and neuroscience. They have also published many neuroscientific papers and journal articles exploring how different forms of spiritual practice and positive thinking affect the brain. “This particular book was my idea, because I’d been working on a form of dialogue practice going back to about 1993,” said Waldman of Words Can Change Your Brain. All of these mindfulness practices, said Waldman, have been well documented as having many benefits – from helping lower anxiety, physical stress and emotional stress, to equipping people with better control of their emotions and raising their self-awareness and social awareness. Waldman suggested starting by bringing mindfulness into daily activities, like eating. 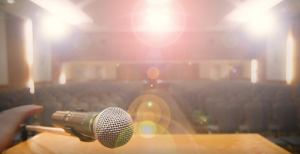 In 1993, Waldman and Newberg began asking themselves questions like how often are we aware of the words we speak, of the feelings behind those words, of how those words affect the person we are speaking to; how often do we take the time to really savor and pay attention to what the other person is saying, their facial expression, their tone of voice? After more than 20 years of research into what speaking mindfully means, they began working on Words Can Change Your Brain, which includes all their new research findings. “Some of what we discovered, based on many different types of neuroscientific studies, is that the slower you speak, the more the listener’s comprehension’s increases,” said Waldman. “Their body also relaxes when you speak more slowly. And, with less physical tension, there’s more ability to be socially connected and engaged with the other individual. “As our research unfolded, we recognized a very important neurological fact – that, consciously, we can only be aware of about seven to 10 words at a time. So, we created what we called a ‘communication game.’ We have people sit down and face each other and we ask them to speak very slowly and briefly, just one sentence. While they are doing so, we want them to experience what those words actually feel like. Then, they pause after speaking one sentence briefly. They pay close attention to the other person’s face and tone of voice while they speak … and you go back and forth like this. Participants in this process were paired with people they did not know and they were not told what to say in their one sentence. The researchers found that, even when they conducted this experiment in a room with 1,500 people, within four to seven minutes, many people found themselves experiencing profound, intimate dialogue. Waldman went on to explain that, when it comes to communication, of the seven different elements of effective communication, words are Number 7. Number 1 is facial expression, followed by tone of voice, body language and the emotional or mental state you are in. “So, the more relaxed you are, the more you’re actually in the present moment, the more the other person can understand what you’re saying, be affected by what you’re saying,” said Waldman. The research found that, when participants closed their eyes and recalled a pleasant memory, visualized someone they greatly love or an event that brought them great satisfaction, 90% of them had a half-smile on their faces. Words Can Change Your Brain also documents that one single negative word triggers a dozen different stress neuro-chemicals in the brain, while spoken positive words have very little effect on the brain. “So, the brain is designed to encode into memory every negative thought, feeling and event that we have, yet it doesn’t really do that with positive experiences,” explained Waldman. “However, if you have a brain that is filled mostly with negative memories, you’ll become chronically anxious and, eventually, chronically depressed. As Waldman presented their discoveries to the business world, he was reminded that, in this world, almost no one will give you more than 10 to 60 seconds. Most people cannot do a five-minute meditation, he said. But, Waldman found that, if people download the mindfulness talk on their phone or computer and are willing to take 10 seconds to do one mindful yawn when they hear the alarm ring – simply notice how a yawn feels – there can be benefits. “We have over 43 documented studies that show that yawning is one of the fastest ways to slow down an overly stressed brain,” said Waldman. “In fact, a dozen yawns or so can temporarily alleviate symptoms of Parkinson’s, epilepsy, migraines, what have you. So, yawning is the fastest way to alleviate mental stress.